Picture this: You're a high school student, and the final bell of the day has just rung. You leave your un-air-conditioned classroom and start heading toward swim practice, thinking about how great jumping into a pool would feel after being in sweltering rooms all day. Unfortunately, most of your swim practices are on dry land. Oh, and when you decide to to take a quick bathroom break on your way to practice, you use a porta potty because your school's restrooms aren't currently functioning. WAITING FOR WATER Morro Bay High School's new pool is scheduled to be functional by this fall. As awful and ridiculous as this scenario sounds, this has been the reality for the students of San Luis Obispo and Morro Bay high schools. Thankfully, a massive, five-year construction plan called Measure D is in the process of fixing this. 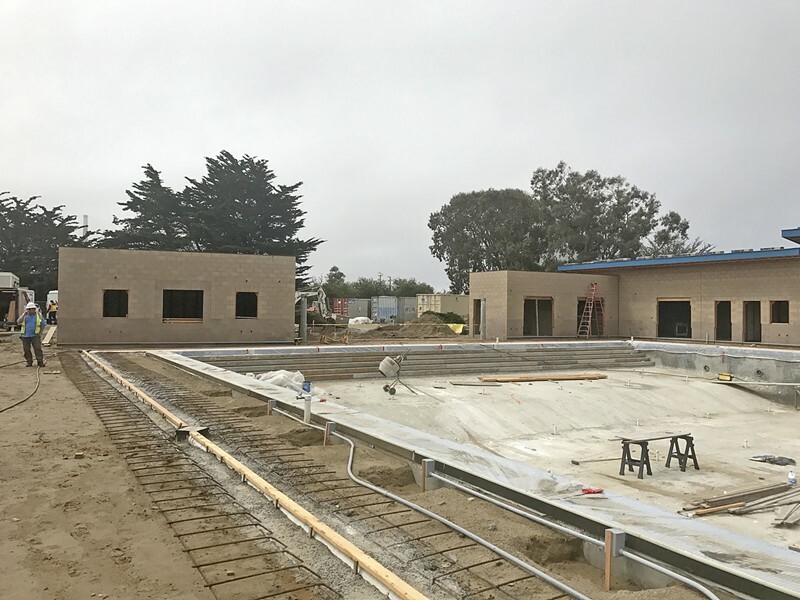 "This summer we did a surge of work," said Anthony Palazzo, San Luis Coastal Unified School District director of facilities, operations, and transportation. "Now the students are going to see the changes." It all began in 2014. Measure D, a $177 million bond measure, was proposed by SLCUSD and passed with 72 percent approval. However, it was not until two years later that any construction started happening. "From the get-go, we got the community involved—staff, students, parents—and said, 'Hey, what do we want to do?'" said Ryan Pinkerton, SLCUSD assistant superintendent of business services. "That alone took about eight months. Then we hired architects to design it all, and that can take nine months to a year ... . The hardest part is that it takes a long time." Though every step of the plan took a while, Pinkerton said that the longest was the approval process. In order to become reality, Measure D had to be approved not only by local voters, but also by the DSA (Division of the State Architect), which takes about a year. Now that all the planning and preparation is out of the way, however, progress has become more visible. 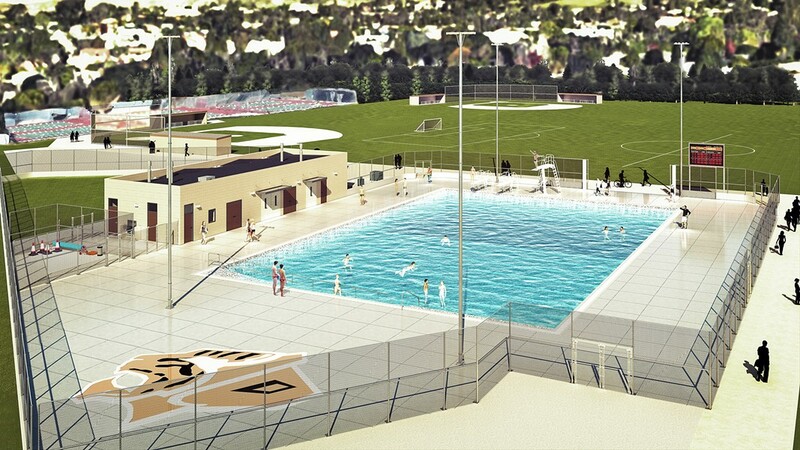 Both high schools are getting new gyms, tennis courts, all-weather tracks, and, of course, pools. Construction for the gyms began in late July, which was ahead of schedule for SLO High since work on their gym was originally planned for winter 2018. "Our budgeting has been spot-on for the first round [of projects]," Palazzo said. "And I'm not just blowing smoke ... . There have been hiccups, not fatal errors." POOLSIDE The finished product will be available to students at Morro Bay High and as a community resource. One of these "hiccups" came during the underground digging where Morro Bay High's old, filled-in pool once stood. Palazzo said that they found "a few surprises, so to speak," mainly in the form of pipes being different lengths, going in different directions, and being in different locations than expected. That stage of the project was successfully completed, though, and the current goal is to have the pool filled sometime in August. "We're hoping we'll be swimming by early fall," Palazzo said. These recreation-based projects are significant because they will benefit not only the schools but the community as well. According to both Palazzo and Pinkerton, SLCUSD will allow those facilities to be open to the public so that the cities can use them for programs such as swimming lessons or exercise classes. There were rumors about this not being the case, specifically with the Morro Bay High tennis courts, after one Morro Bay resident wrote a letter to New Times saying that he was not able to access them during hours they were supposed to be open to the public. "The tennis courts were inadvertently locked by a substitute custodian," Palazzo said. "We wrote a rebuttal and investigated it. ... [The custodian] didn't know better." Pinkerton wrote the rebuttal, explaining the mistake and urging anyone confused about school or district policies to contact the school or district for clarification. As for the more academic-oriented projects, several classrooms are being renovated on both campuses, including a robotics lab for SLO High that should be finished just in time for the new school year. "We'll probably be pushing furniture in the night before school starts," Palazzo said. According to Pinkerton, two model classrooms were set up in SLO High prior to construction to gauge student feedback. "We had things like flat screens, white boards, all around the room," he said. "We figured we should test it out before spending all that money on 200 classrooms." It's not just high school students who benefit, either. Pinkerton said the focus has been on the high schools since a different project, Measure A, had already been passed to improve the elementary and middle schools. But they are "trying to touch every campus in some way." This includes the installation of new phone systems, new fire alarms, and LED lights. "They're huge energy savers, and they come on instantly," Pinkerton said in regards to the lights. "It used to take 15 to 20 minutes for the lights to warm up." All of the construction projects are expected to be finished by summer 2021. For a complete timeline of projects or other information about Measure D, check out sanluiscoastalmeasured.org. Reach contributer Katrina Borges through the editor at clanham@newtimesslo.com.